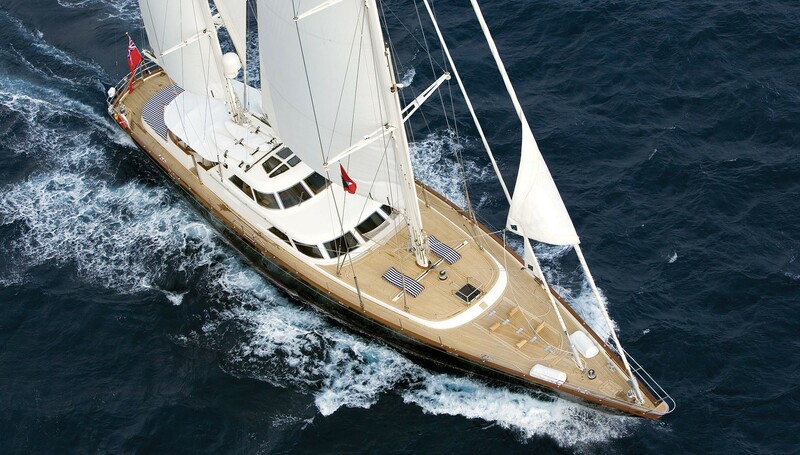 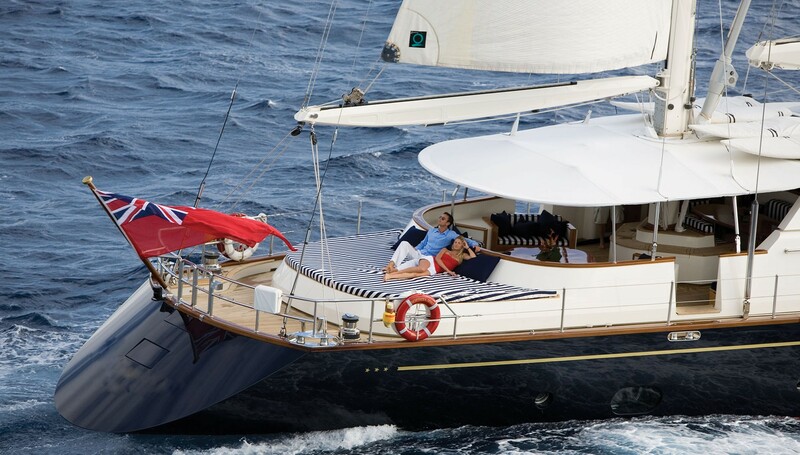 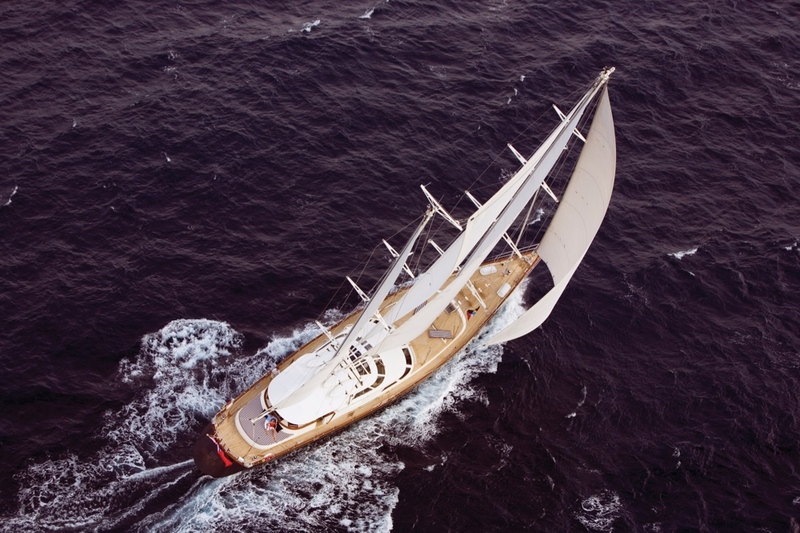 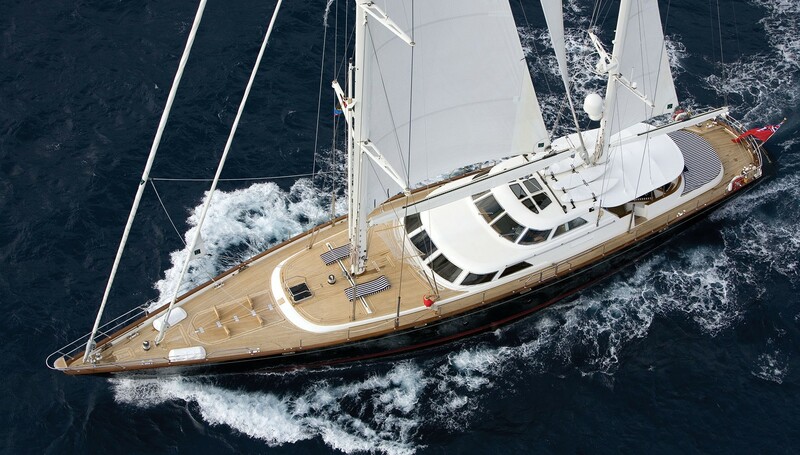 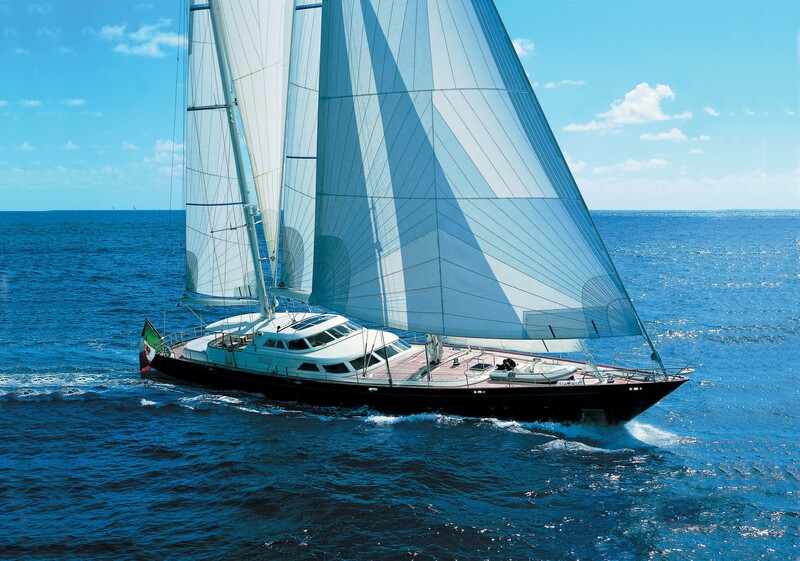 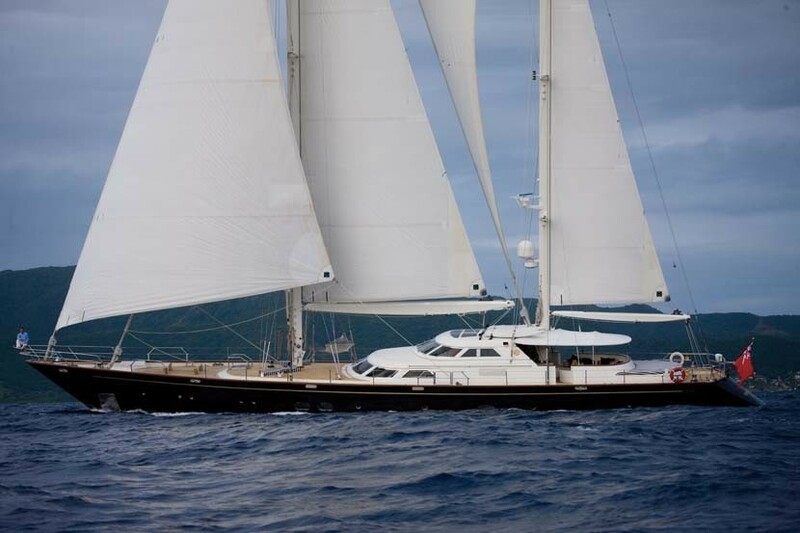 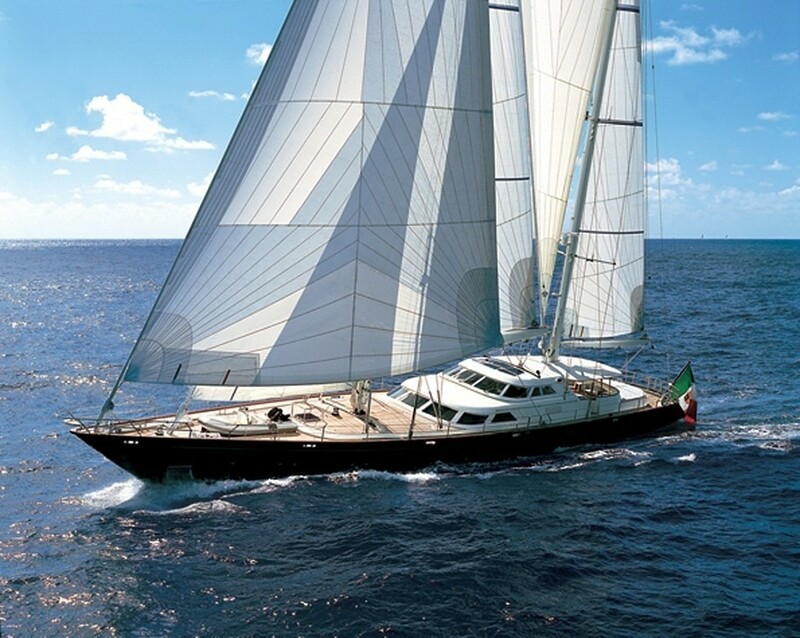 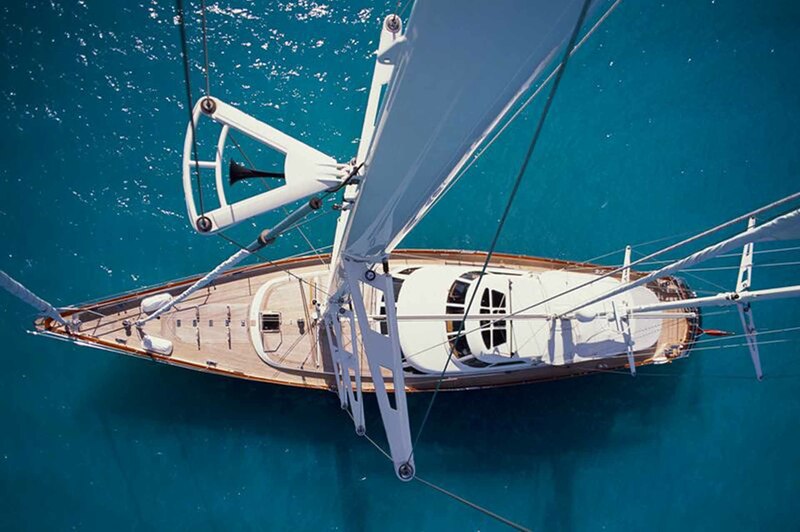 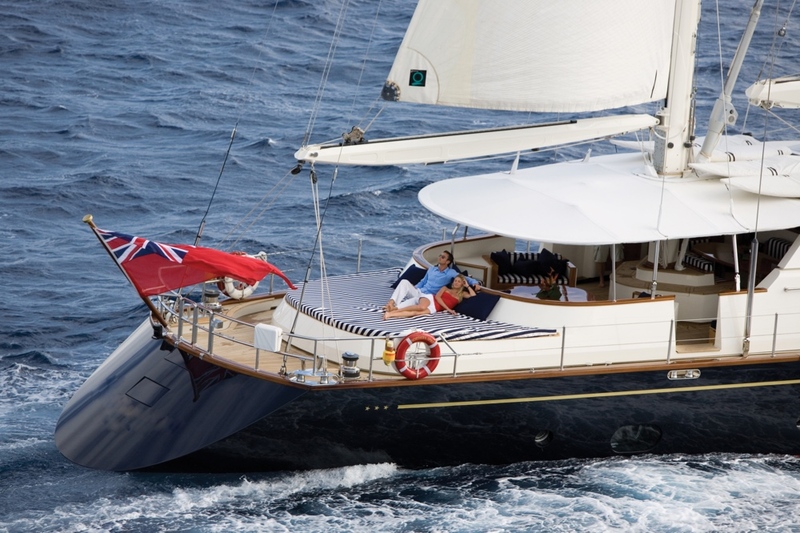 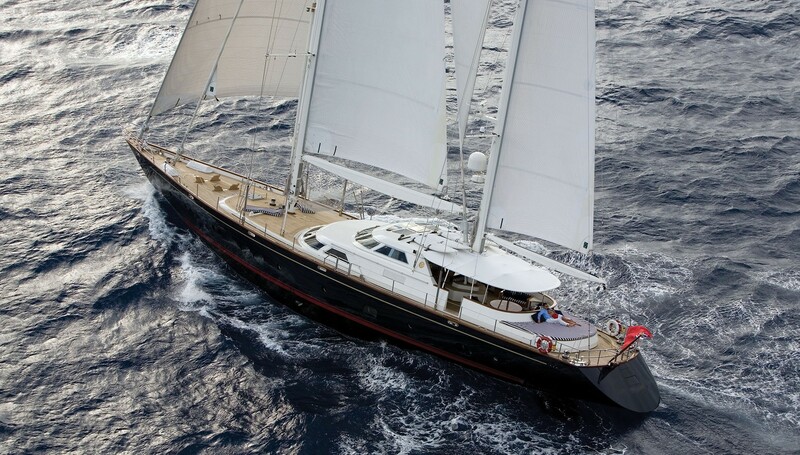 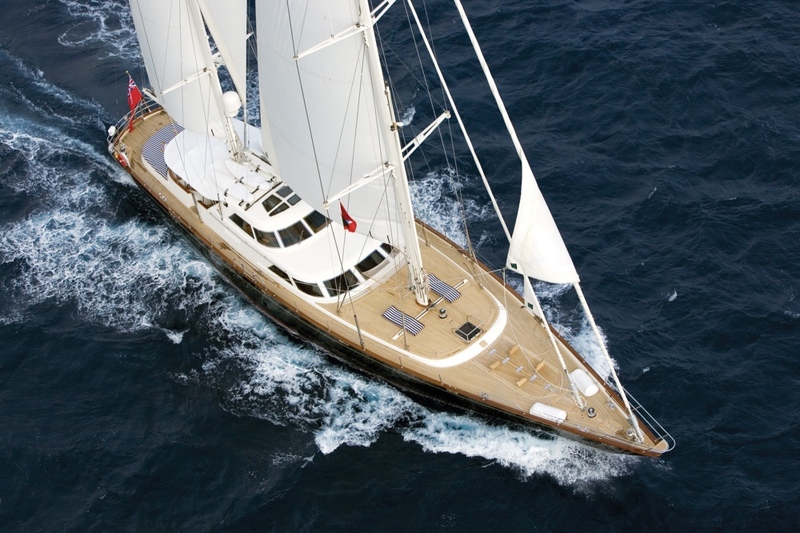 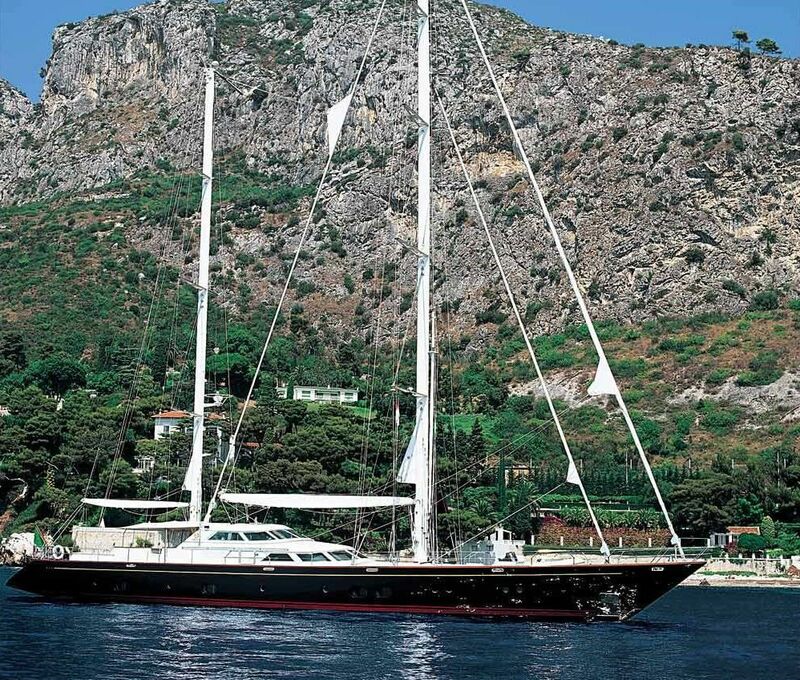 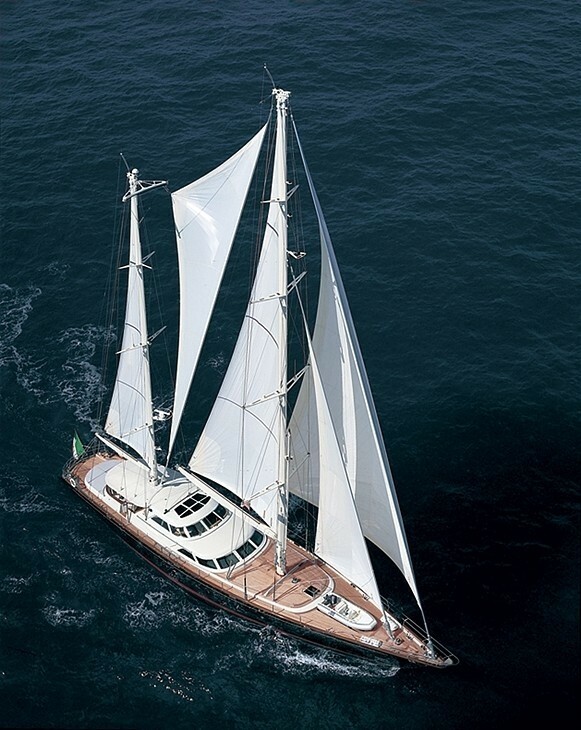 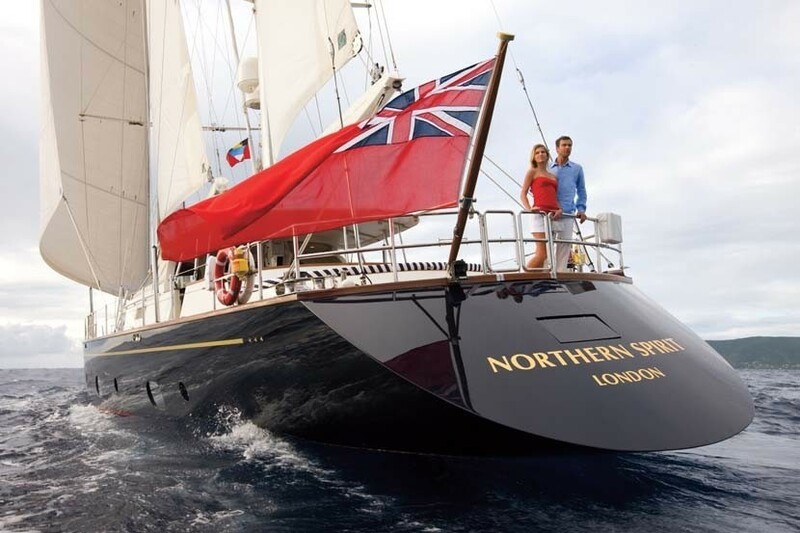 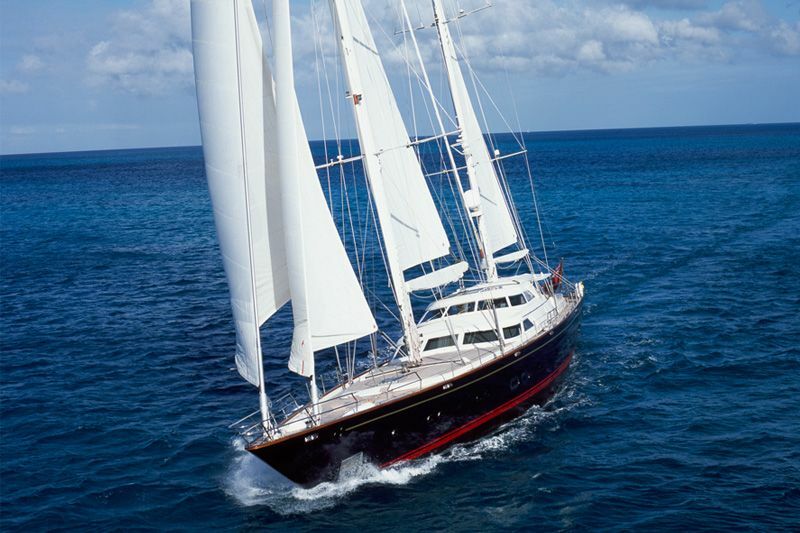 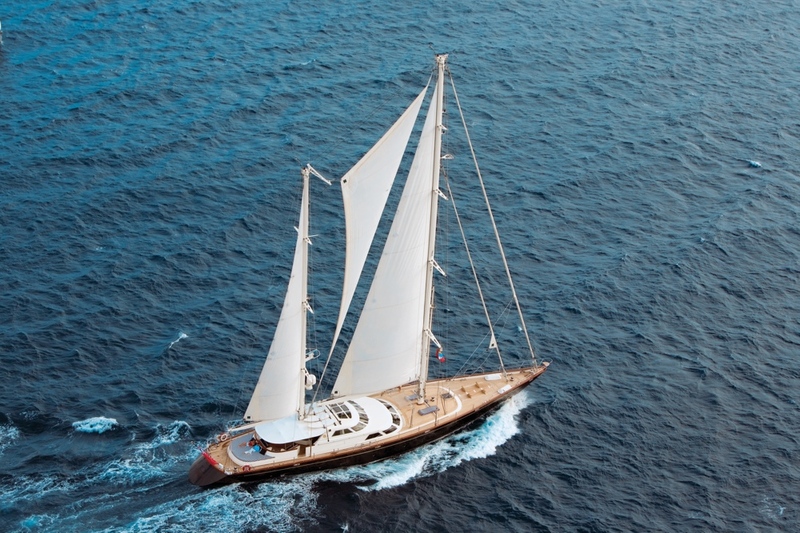 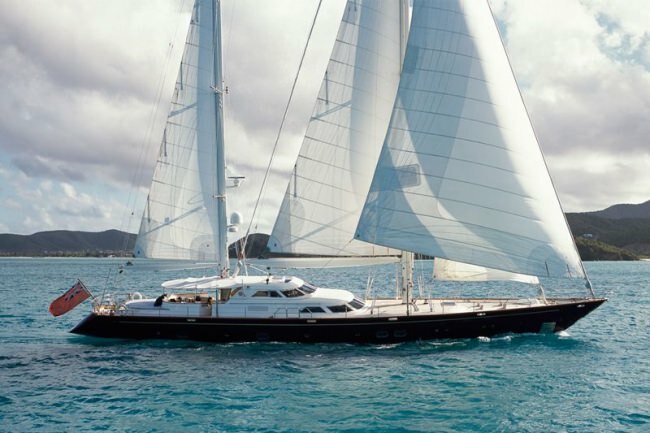 Sailing yacht KHALEESI (ex NORTHERN SPIRIT, Salperton) is a fantastic example of a Perini Navi cruising ketch. 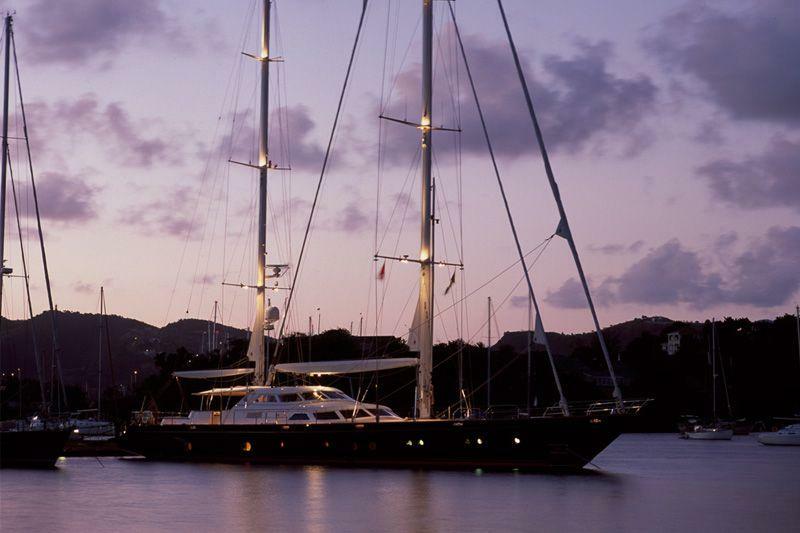 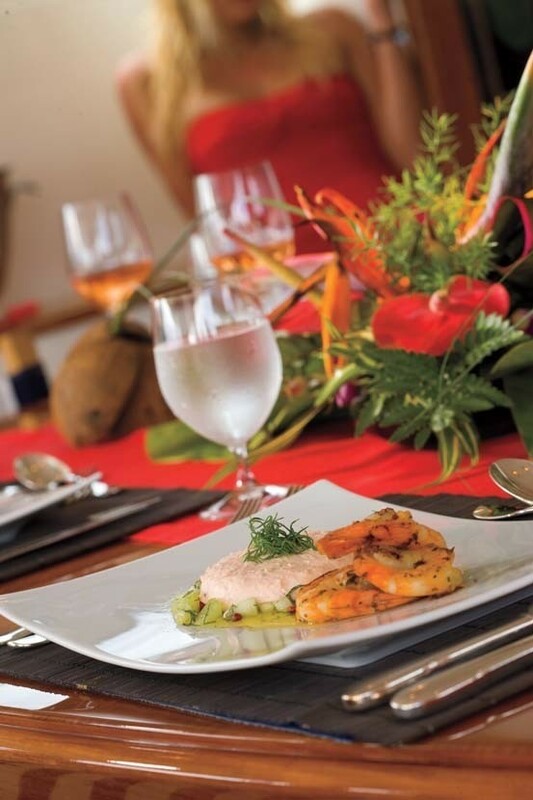 She is a quality yacht and has been well looked after offering everything required to provide a fantastic charter vacation. 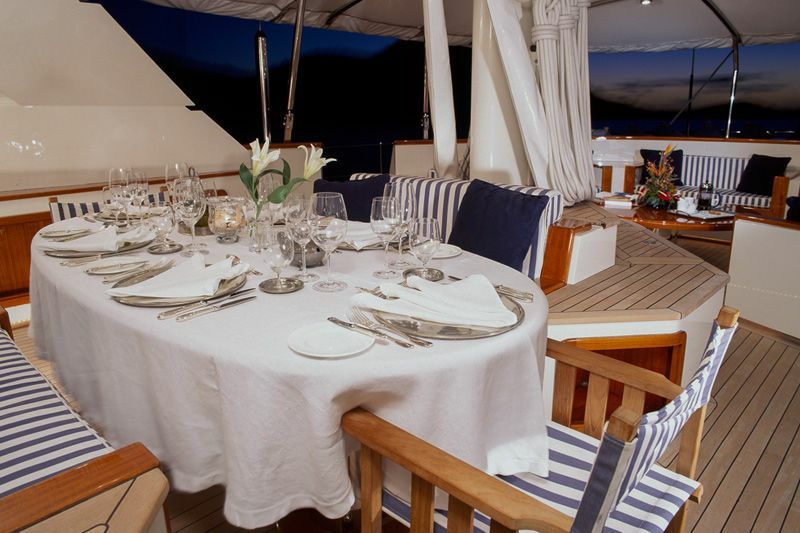 A total of 7 guests can be accommodated in 3 charming cabins. 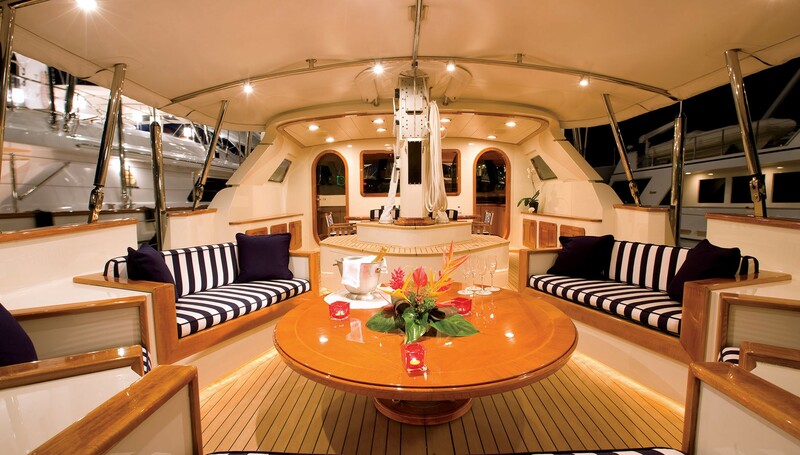 The main cockpit, accessed from both side decks, is naturally split into two areas: one with comfortable seating around a circular coffee table, while the other provides a dining area. 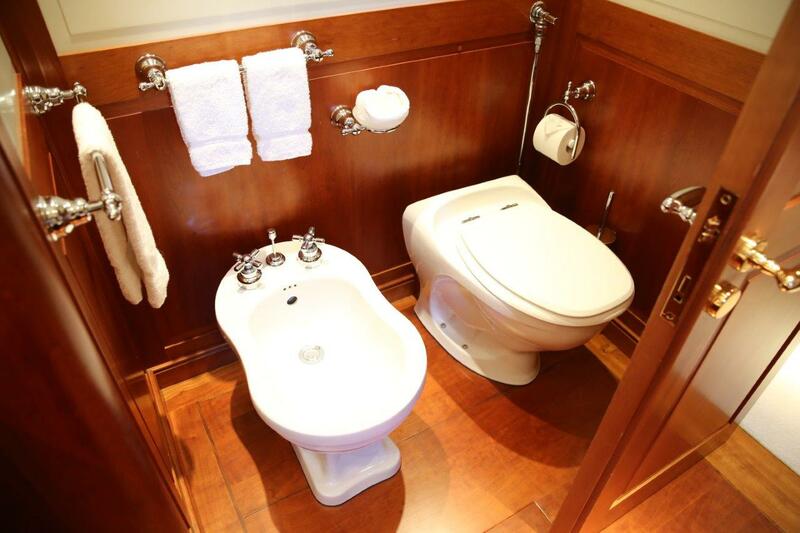 Both can accommodate up to eight people. 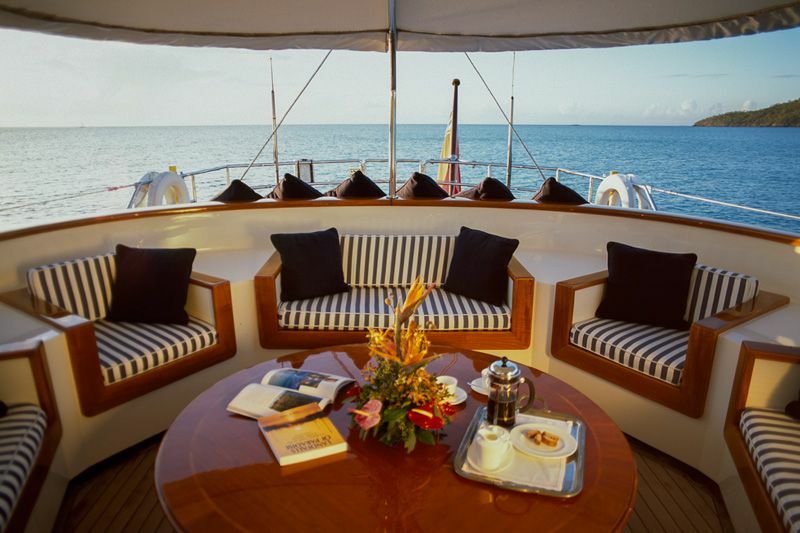 A large raised cushioned sunbathing area is situated immediately behind the shaded cockpit. 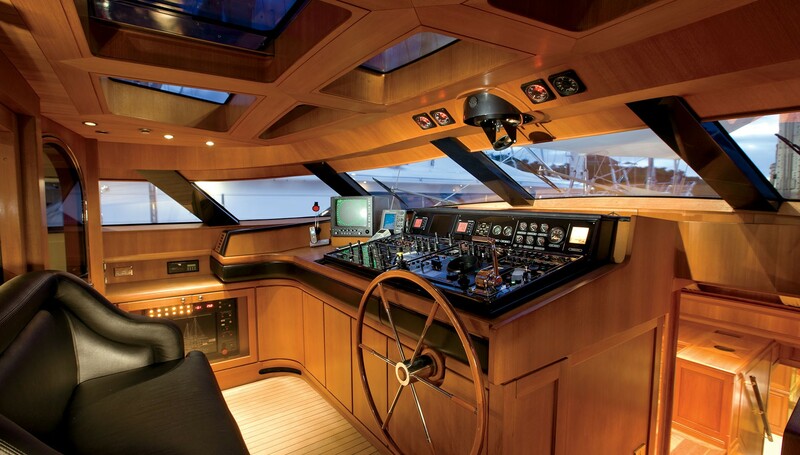 The pilothouse is separated from the cockpit by doors on the port and starboard side, giving guests privacy either underway or at anchor. 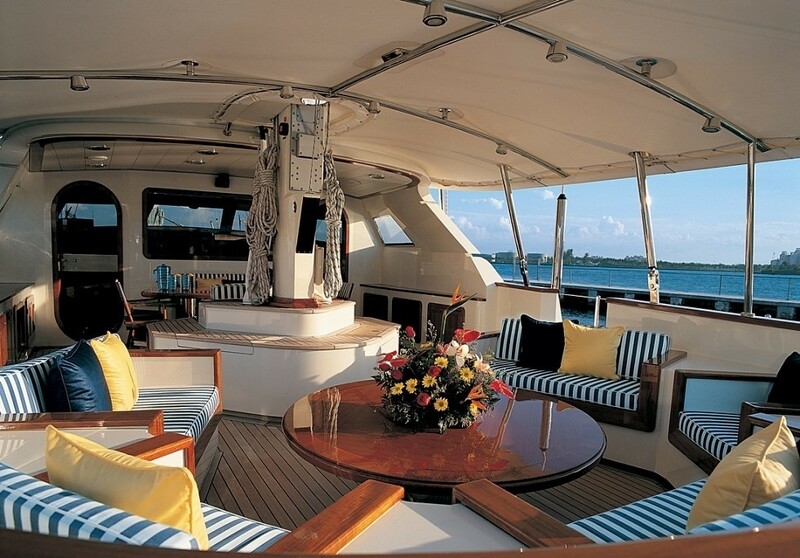 A deck refrigerator is conveniently situated here. 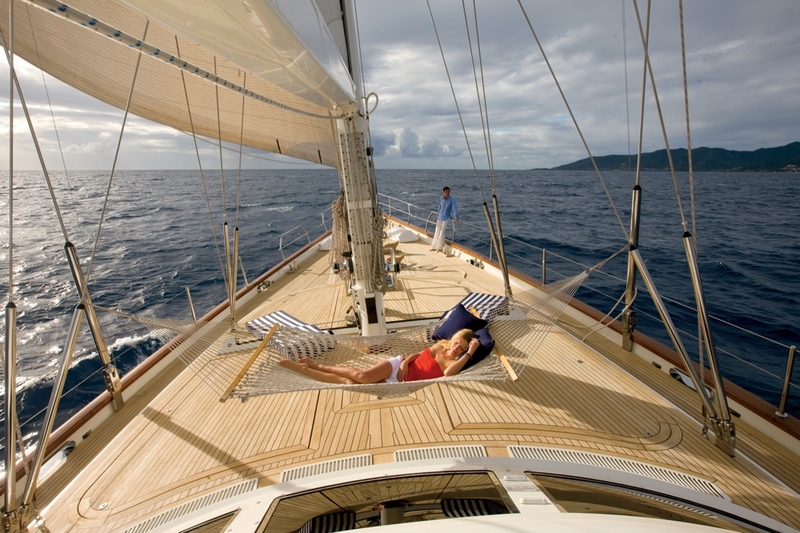 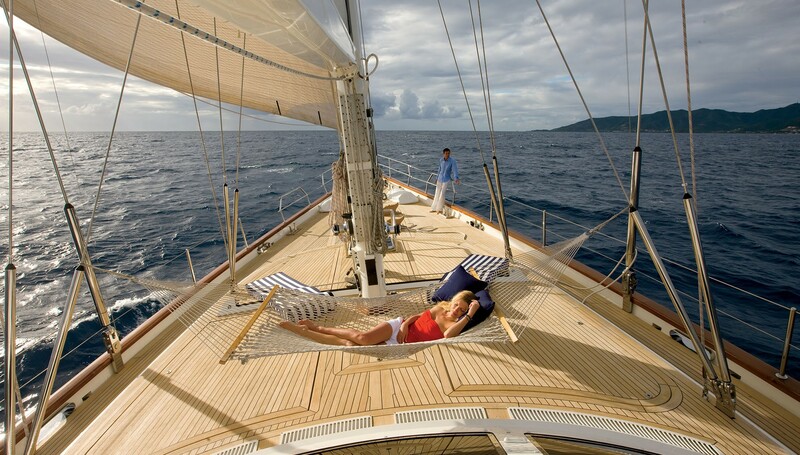 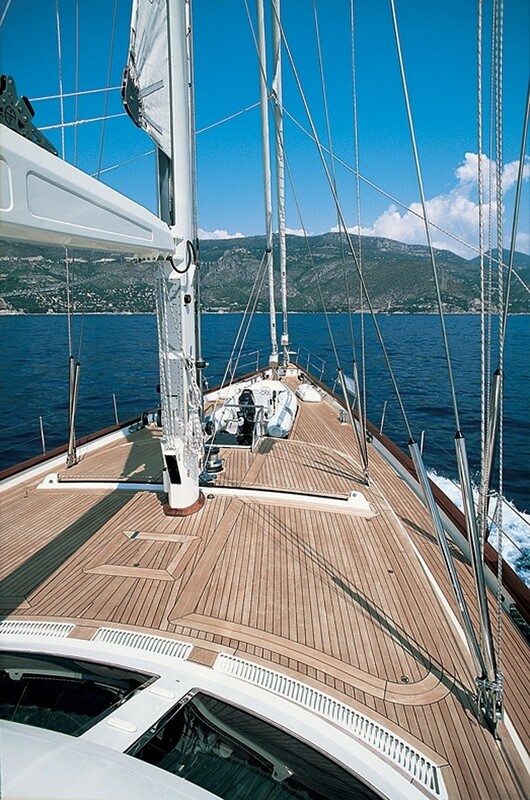 Up forward, under the shade of a loose awning, a hammock and sun loungers take full advantage of the foredeck breeze. 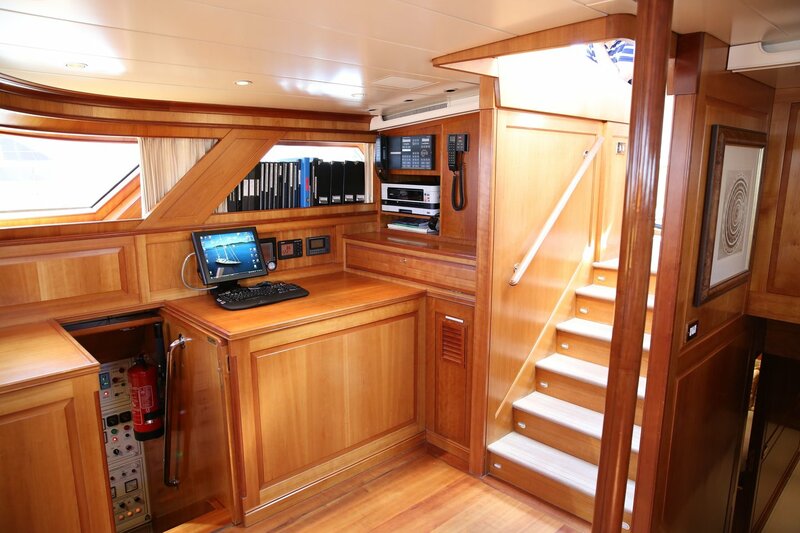 Stairs lead down from the pilothouse to a raised upper saloon. 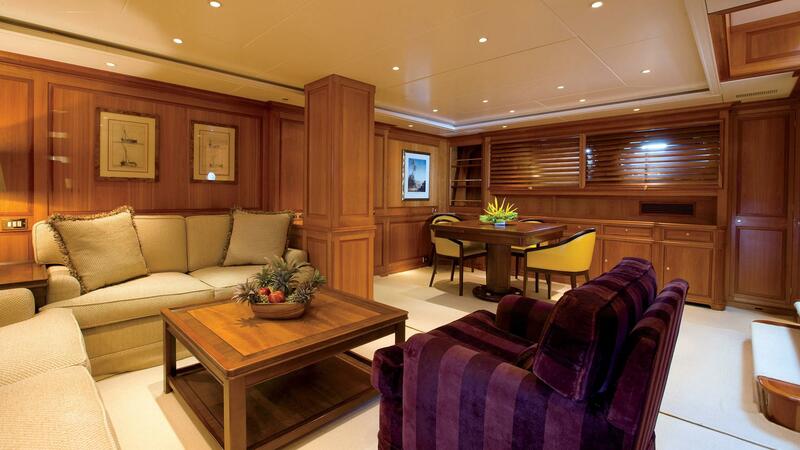 This bright, open saloon has two settees around a coffee table and a forward facing deck, with panoramic views. 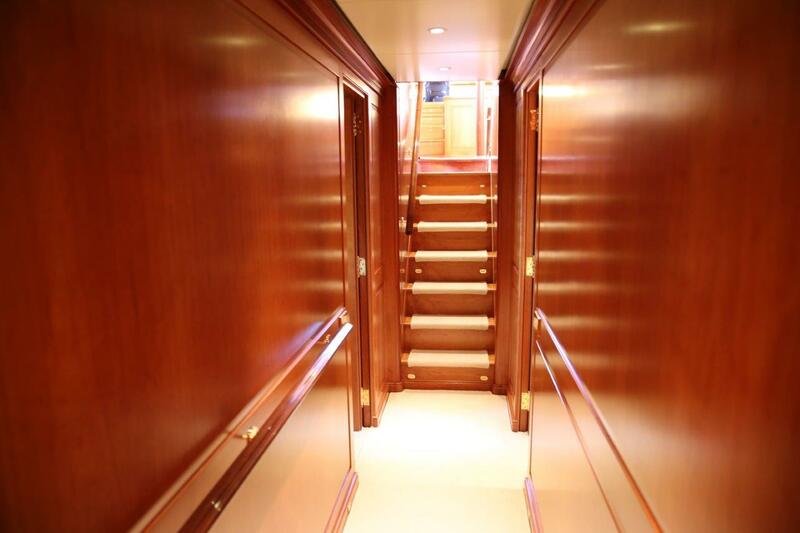 Stairs lead aft to the guest accommodation, while a large stairway forward shows the way to the main saloon. 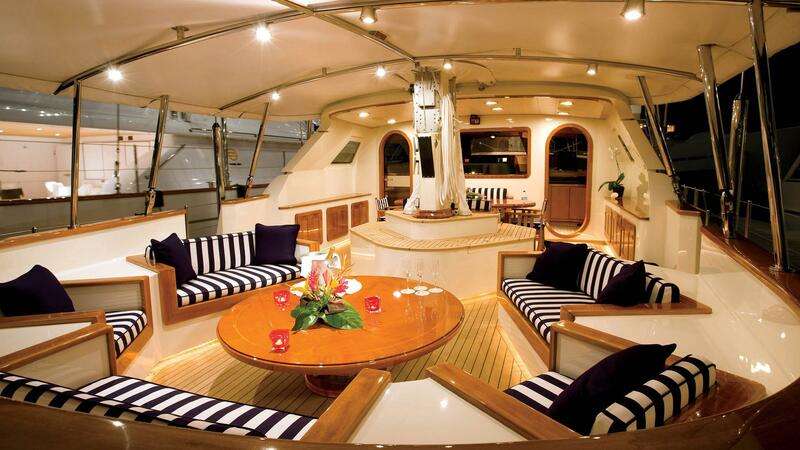 The main saloon, two settees and an armchair are around three sides of a coffee table. 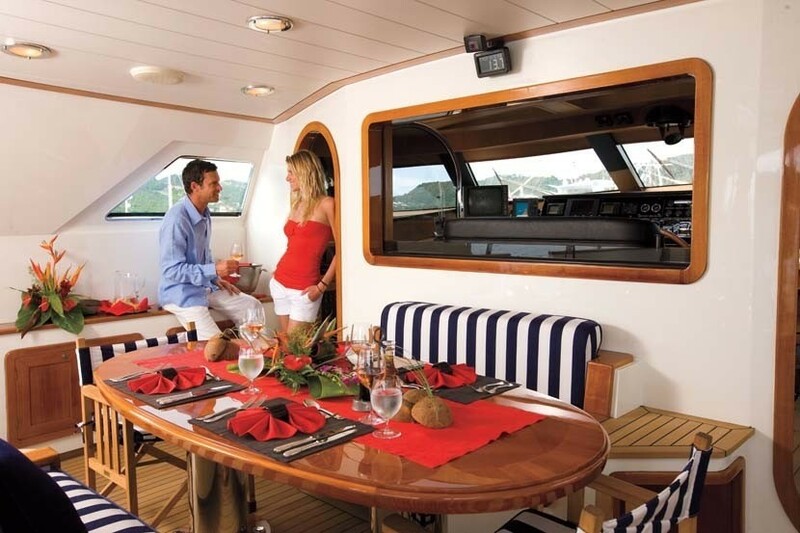 A large hidden plasma screen with surround sound system makes up the entertainment system. 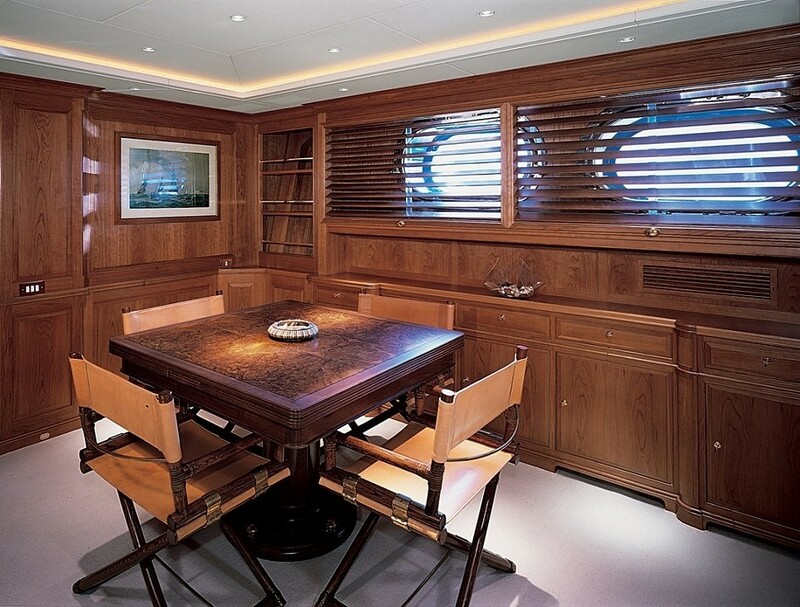 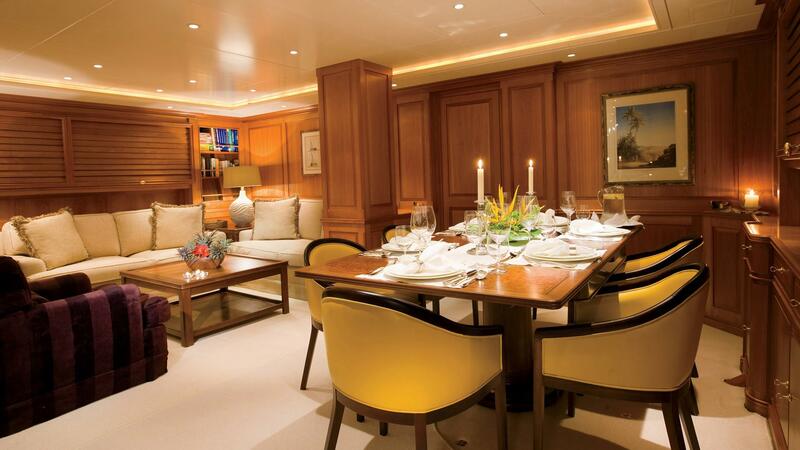 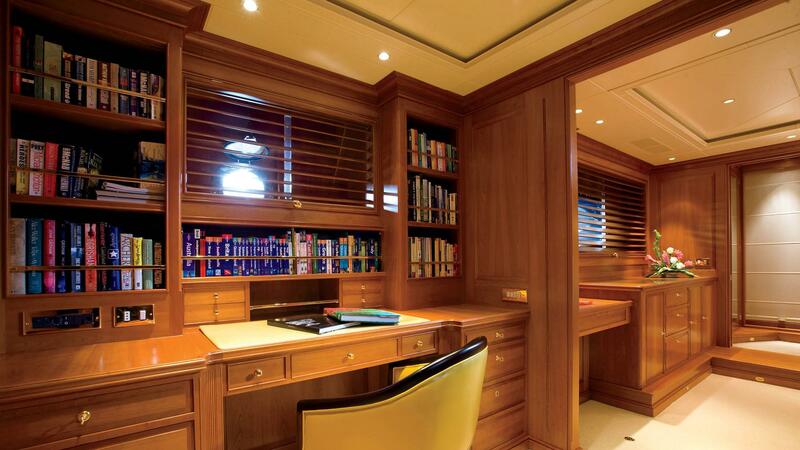 On the starboard side, a more formal dining area has room for six around an extendable, walnut inlaid table. 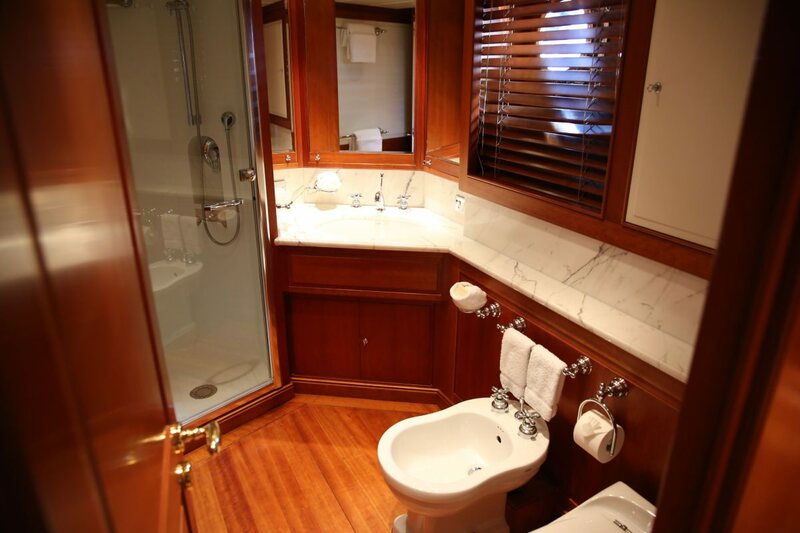 Off the main saloon is a day head to starboard and a small cabin to port, suitable for use as a berth for staff or a fifth crew member. 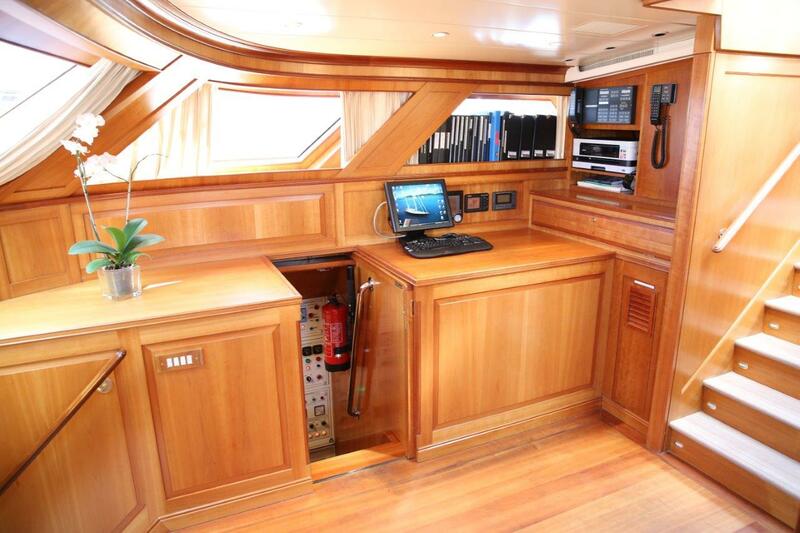 A door forward leads into the galley and crew mess. 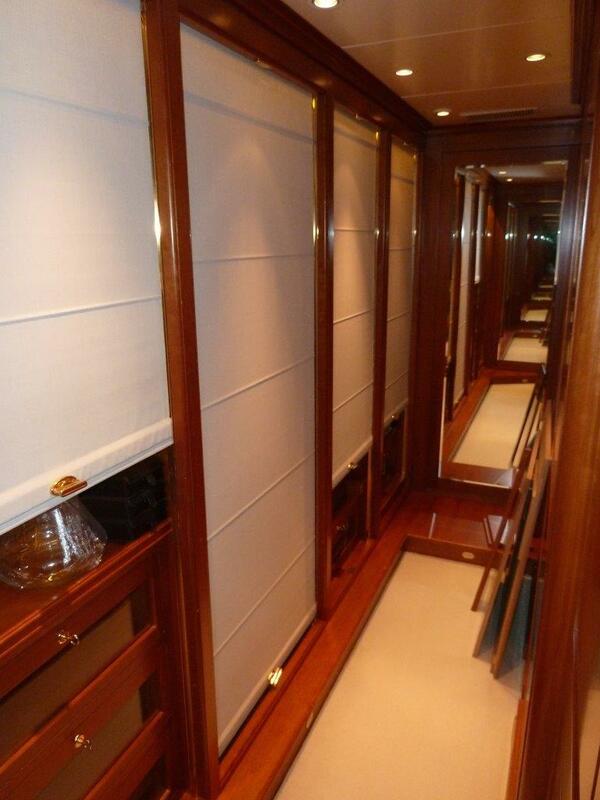 From the upper saloon, the stairs lead aft down a central corridor. 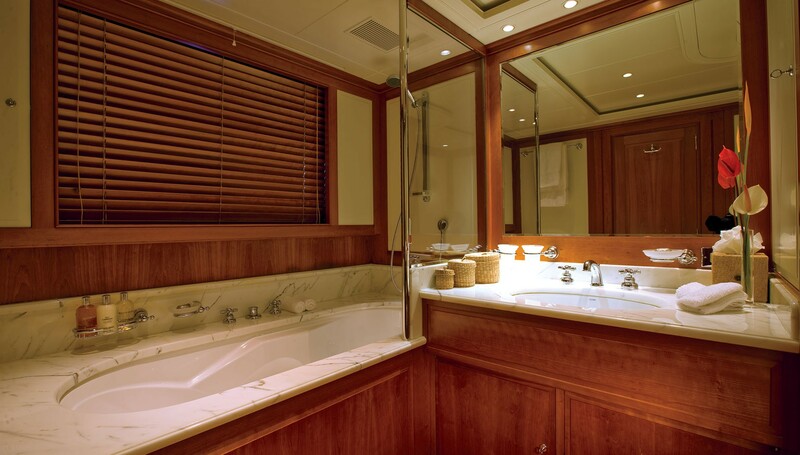 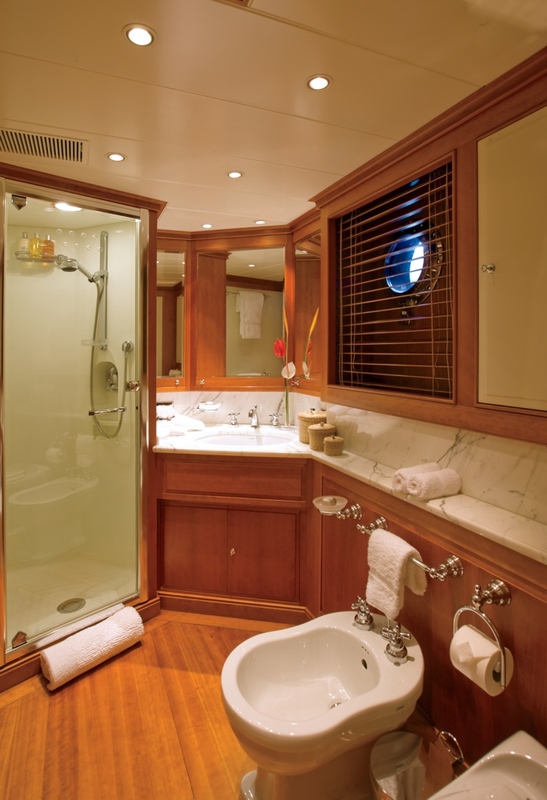 To port and starboard are two twin guest staterooms, the one to port also having a Pullman berth, and both with very generous ensuite shower rooms. 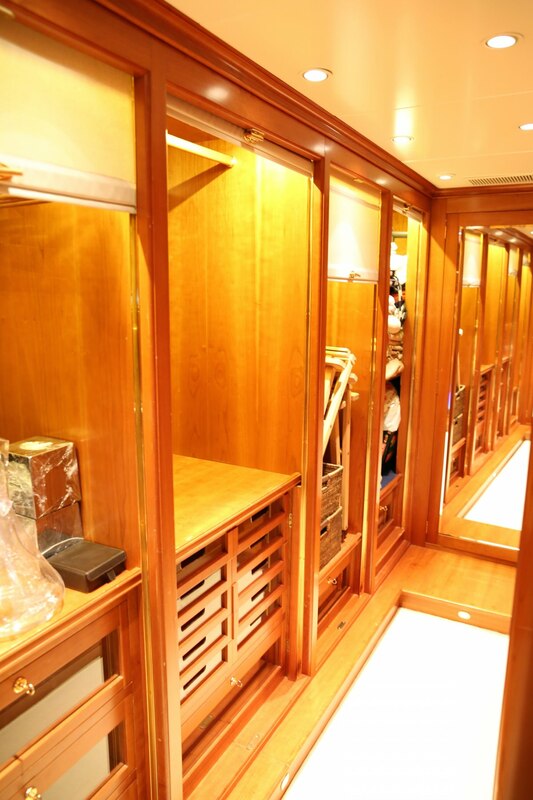 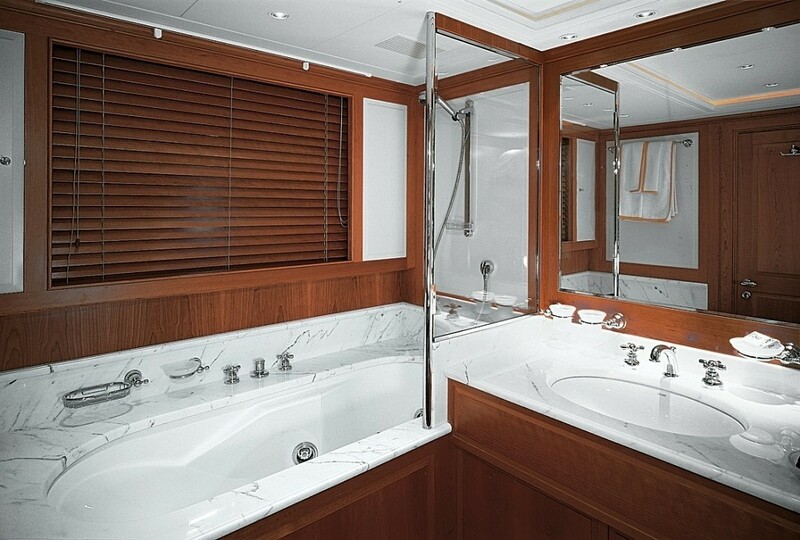 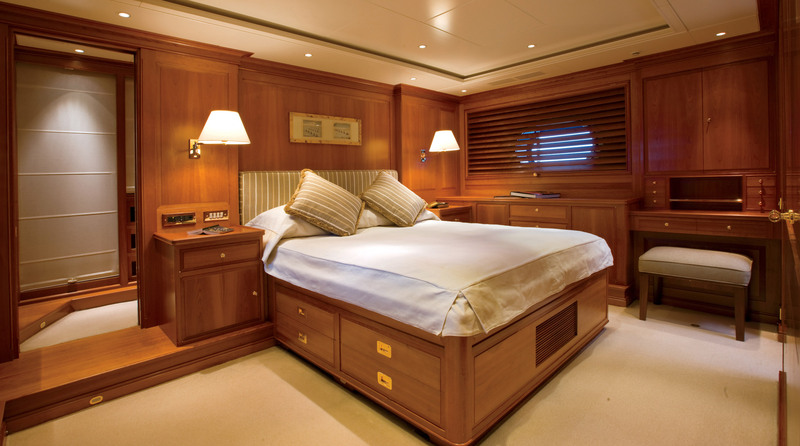 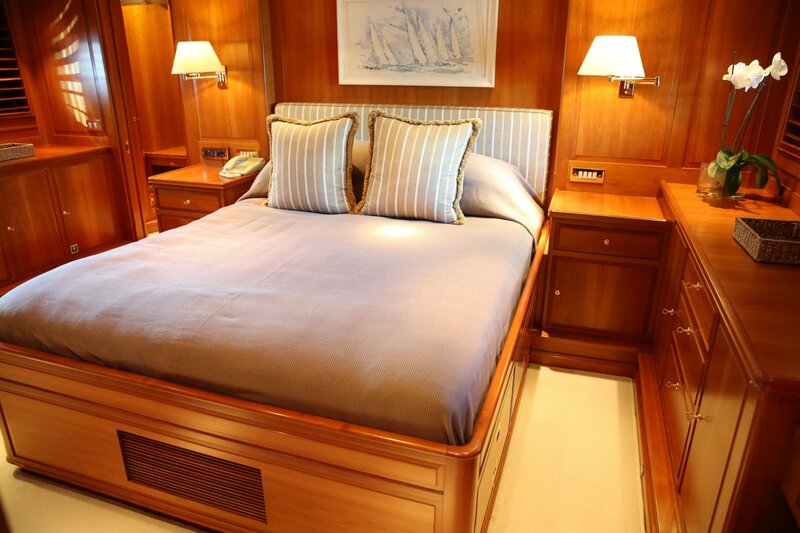 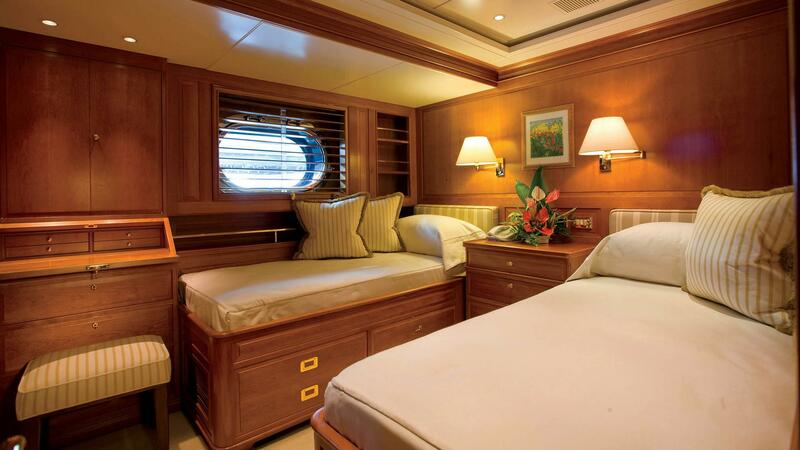 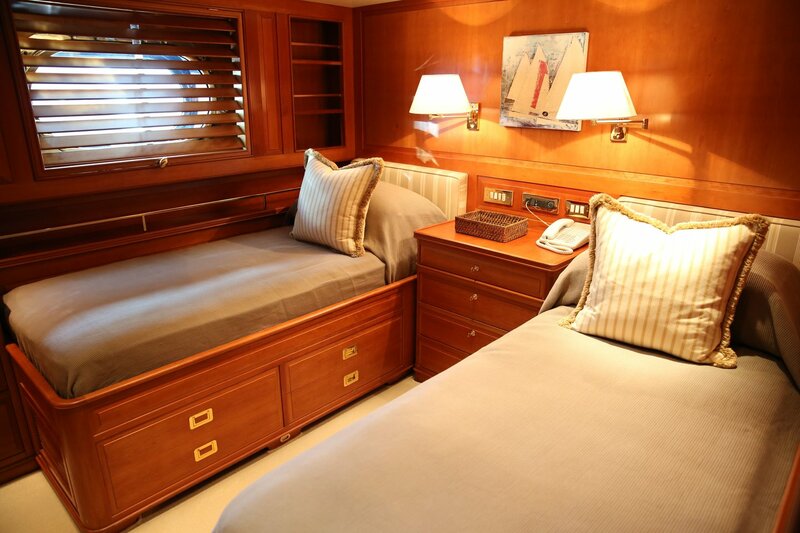 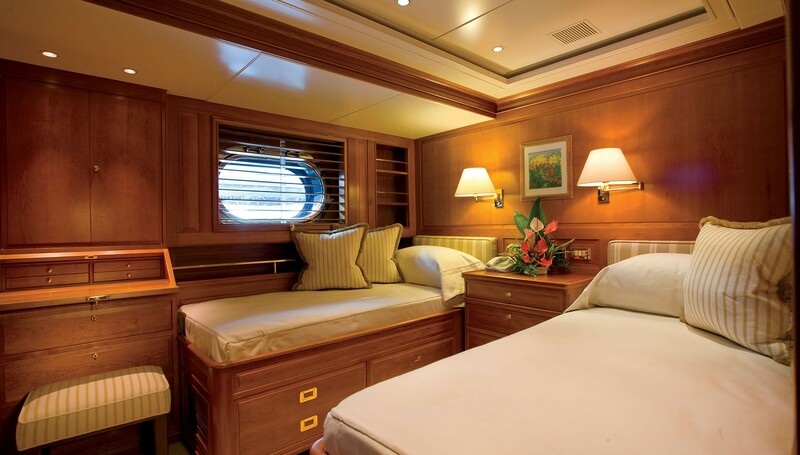 Fully aft is a full-width master stateroom with walk-in wardrobe. 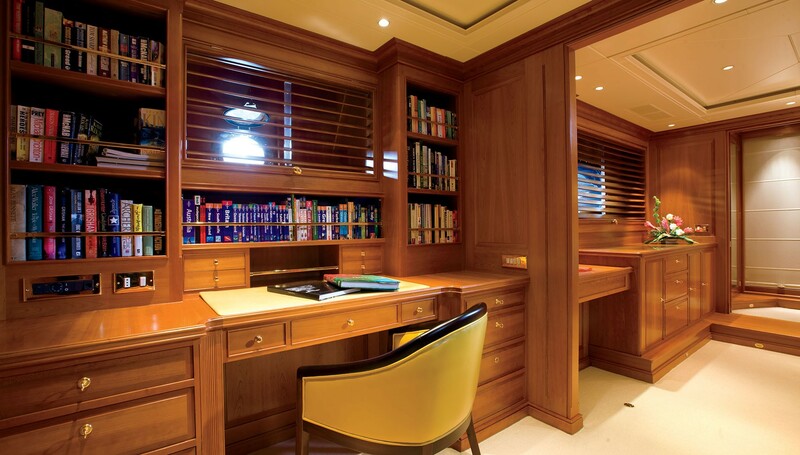 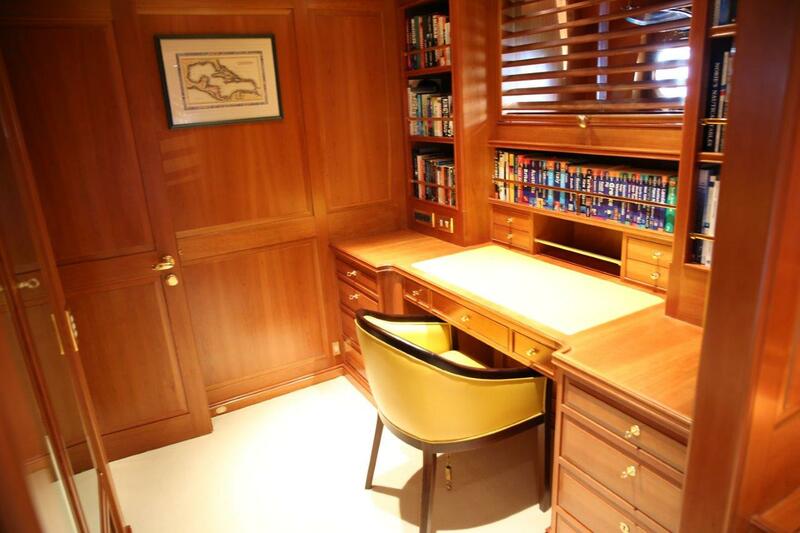 A separate study area and ensuite bathroom with bath, complete the owners’ suite. 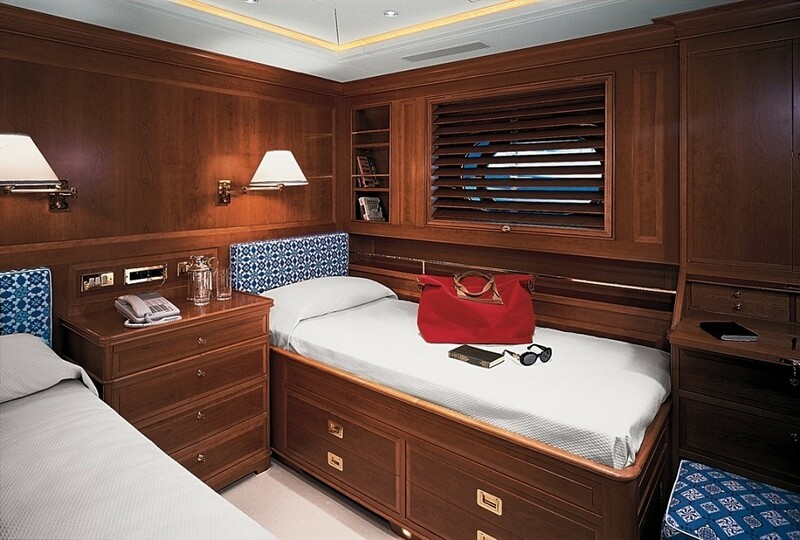 For the size of yacht, KHALEESI has an exceptional amount of different living areas. 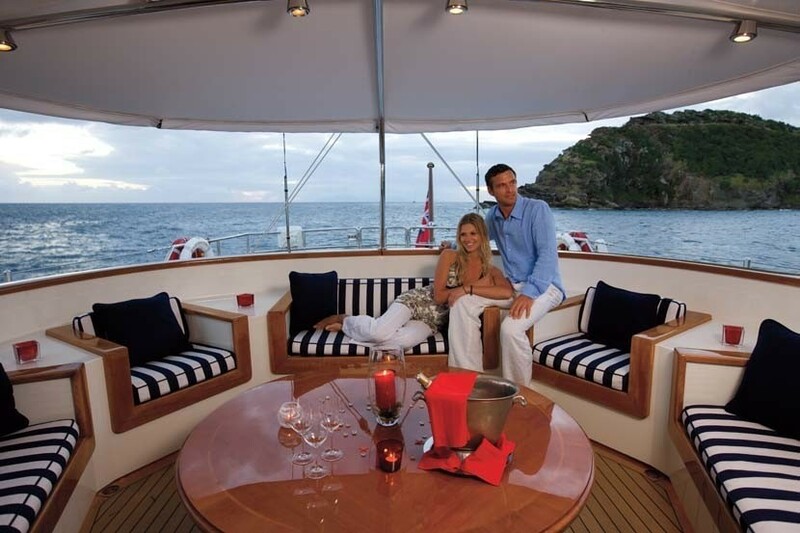 Guests can relax together or can find a quiet area to hideaway. 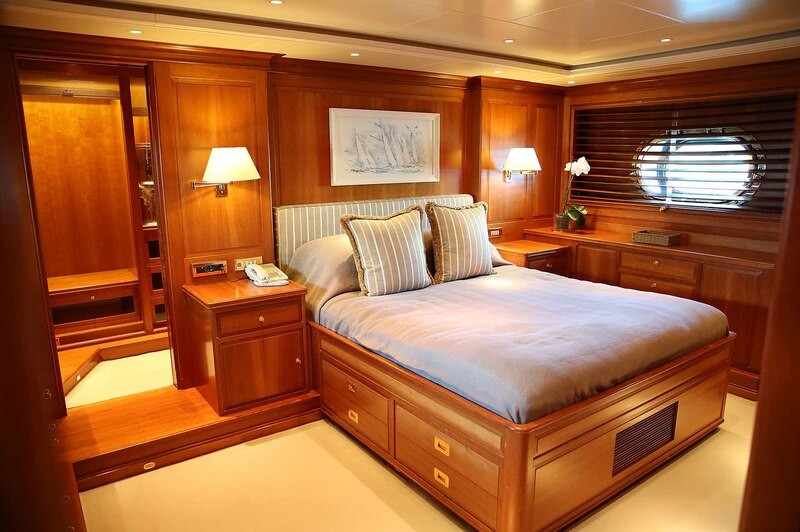 The interior is finished in cherry wood, and the large hull portholes give the interior a particularly light and airy feel. 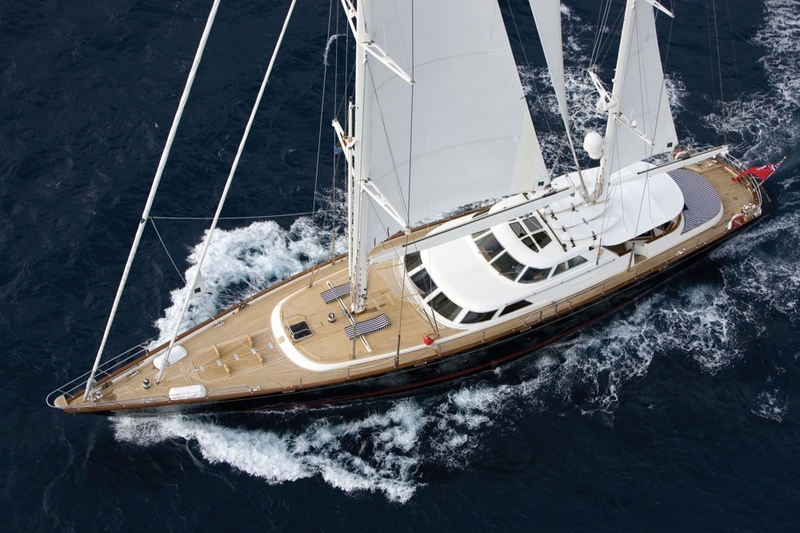 KHALEESI boasts all the finest features to be expected from the renowned Perini Navi shipyard of Viareggio, Italy and she combines performance with an exceptional degree of comfort. 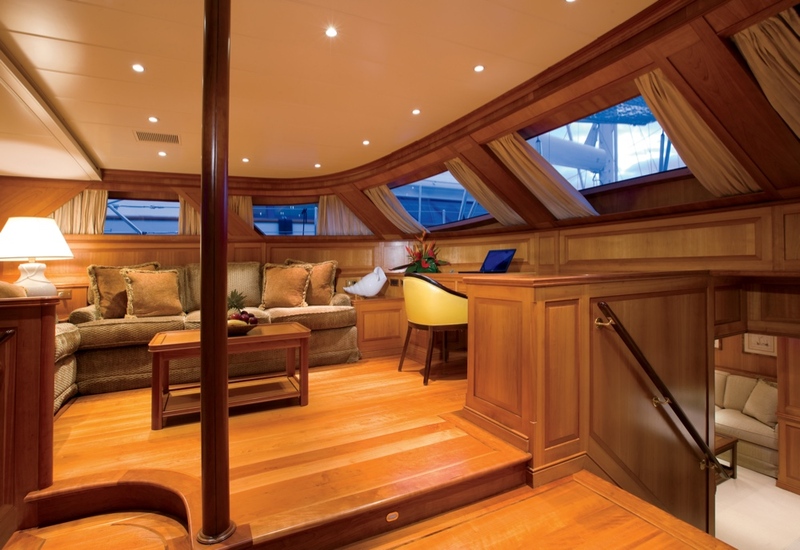 In addition to a large aft deck area, there is fine saloon space on two levels, making her ideal for cruising in all weather conditions. 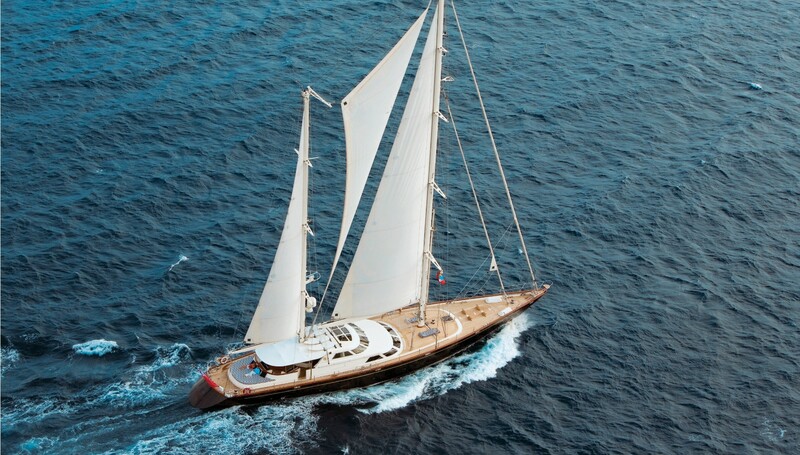 Indeed KHALEESI has proven her long-range sailing credentials with a full global circumnavigation. 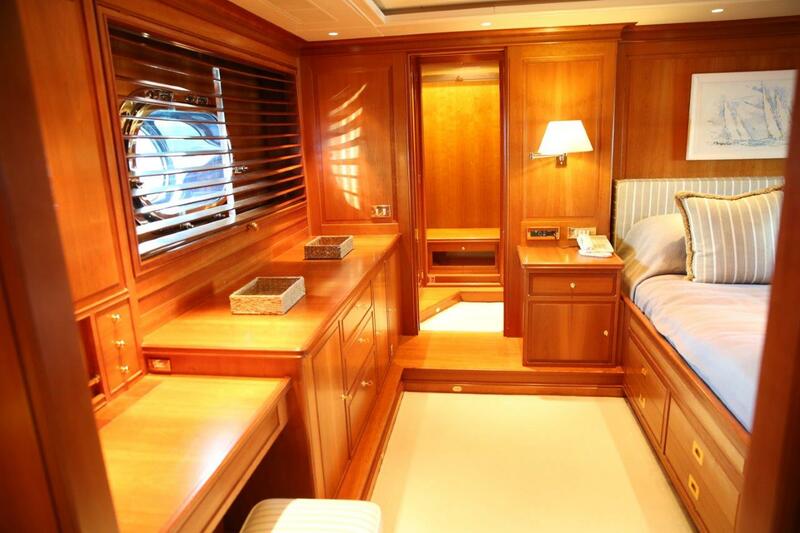 Following the renewal of her ABS Special Survey and an extensive refit in Spring 2006 she is in magnificent condition. 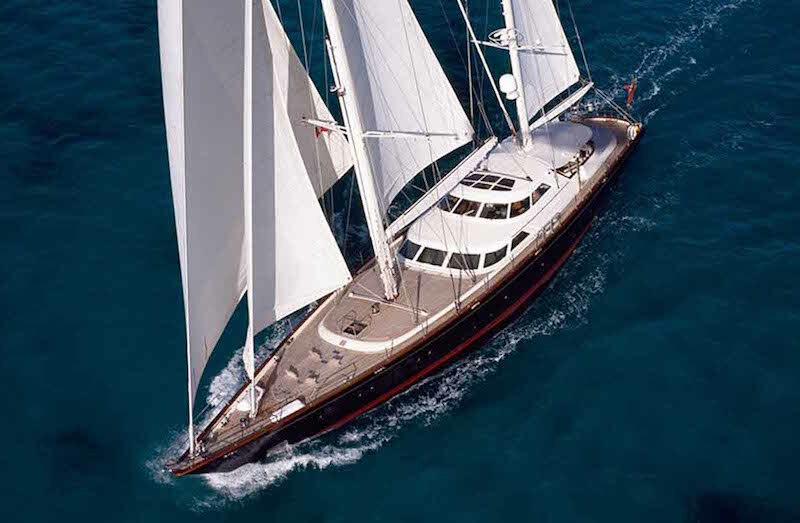 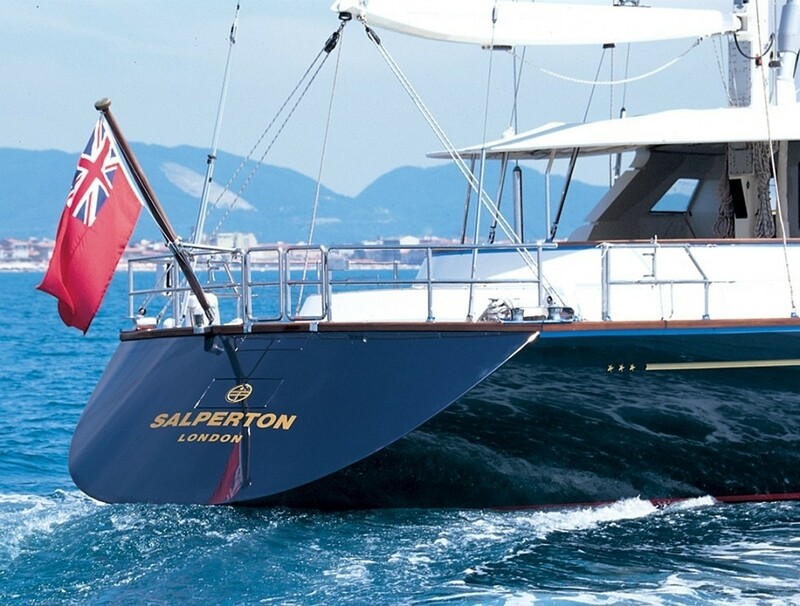 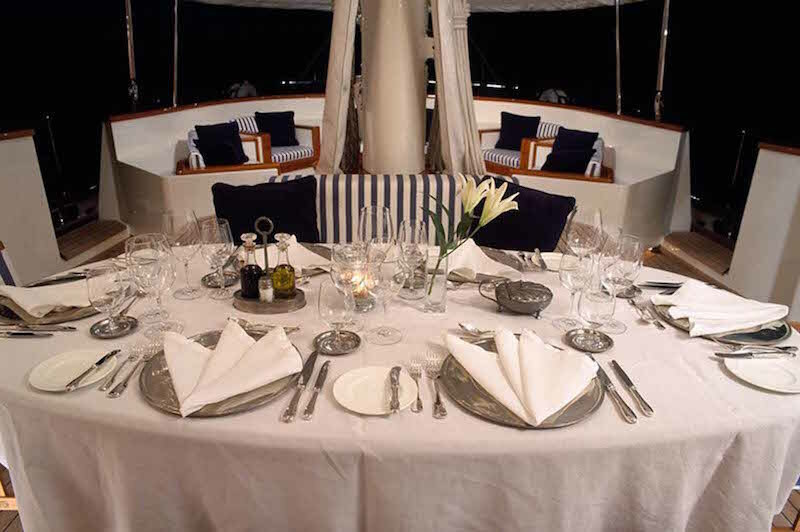 Luxury Sailing Yacht KHALEESI has one double and two twin staterooms (one with a Pullman bunk bed) which accommodates a maximum of 7 guests on board. 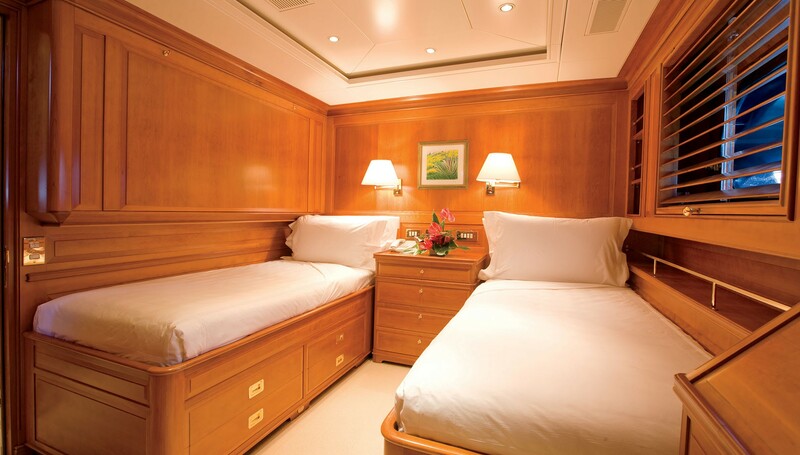 There is a spacious Master cabin, and two twin cabins with a Pullman bed. 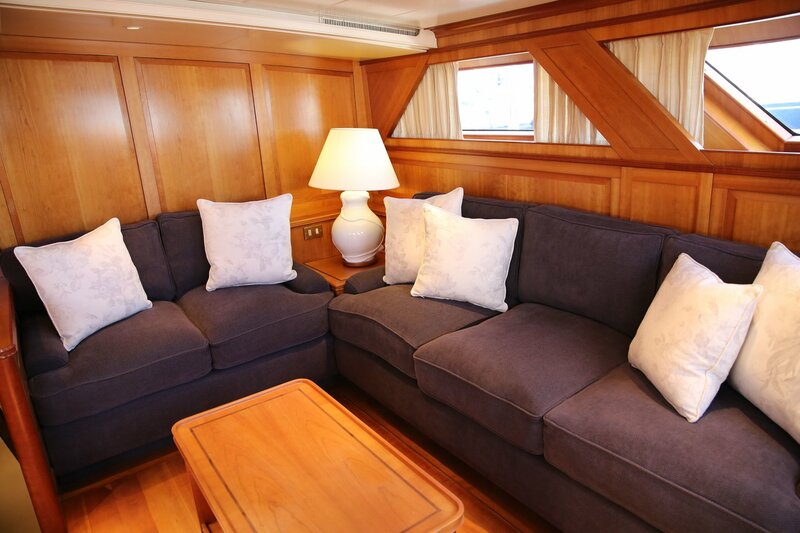 Each guest cabin has beautiful furnishing and inviting atmosphere.